As Halloween Approaches, Think About Where Your Chocolate Comes From | Small Farmers. Big Change. « Milestones in the Small Farmer Banana and Avocado Trade! 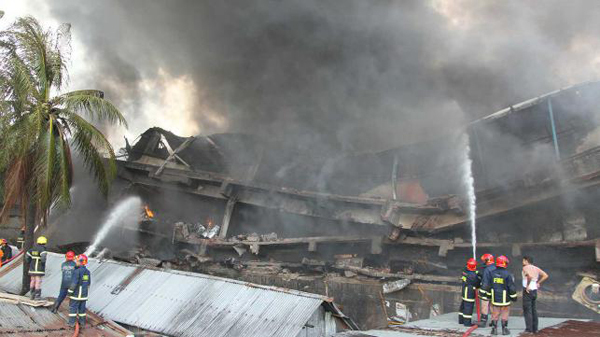 On September 10th a fatal fire at the Tampaco Foil Packaging Factory in Bangladesh left 41 dead, 10 missing, and 35 critically injured. Over one month later, the families of the victims have received not one penny of compensation from the loss of their loved ones, nor one additional paycheck from the deceased workers’ salaries. The factory made the packaging for the products of various multi-national companies including Nestle. To date, not only have the affected workers’ families remained uncompensated, but Nestle has made no commitment to ensure that the factories involved in their supply chains improve their working conditions and safety practices. HOW CAN THIS CONTINUE TO HAPPEN? WHO WILL HOLD THESE COMPANIES ACCOUNTABLE? Please read more about this tragic incident from our friends at Fair World Project and then please consider signing the petition to hold Nestle accountable. Next time you buy some chocolate for yourself or your friends and loved ones, please consider the source, their supply chain practices, and their ethics. People’s lives depend upon your actions.